Soak Foxtail millet and Greengram (split) separately for minimum 30 minutes before cooking. Pour 1 cup of water in a vessel and let it boil. Wash the Greengram once and put it in the vessel. When the dhal is half-cooked, put the Foxtail millet also and add the remaining water. Partially cover the vessel with a lid. Use a ladle and mix the ingredients in the vessel frequently. Meanwhile, powder the jaggery ball. If it is clean, you can add the powder directly to the vessel. Else, put the powder in a separate bowl . Add little bit of water and heat it up. Stir it for 2 to 3 minutes. Once the powder is fully dissolved, filter the syrup and keep it aside. Also dry roast the cashew nuts and keep them aside. 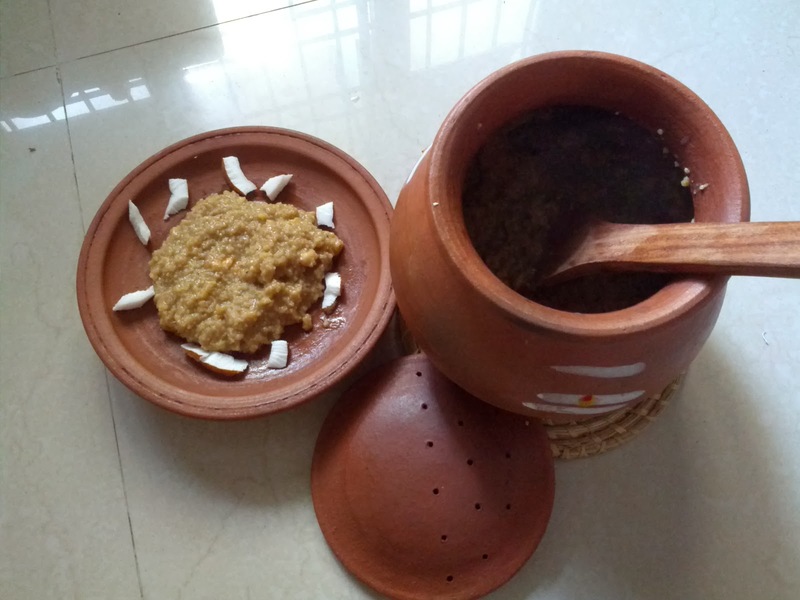 When dhal and millet are cooked fully, add jaggery powder or jaggery syrup and mix well. Turn-off the stove after 5 minutes. Add cardamom powder and dry roasted cashewnuts now. When pongal becomes slightly cool, add grated coconut as well and mix it once. Foxtail millet is the right choice for making sweet pongal or any other sweet varieties. While cooking millet and dhal, add extra hot water if the rice consistency is becoming very thick. Because, Foxtail millet absorbs more water and pongal should be mushy. This preparation is based on Satvik method and hence ghee is not added.